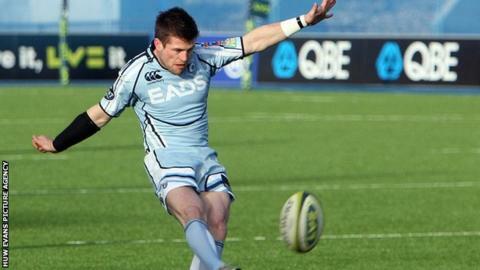 Saracens' new artificial pitch has received a thumbs-up from Blues' former Wales fly-half Ceri Sweeney. The Blues' 19-11 defeat in the LV= Cup was the first professional rugby match played on the Allianz Stadium pitch. The Welsh Rugby Union are considering installing a similar surface at the Millennium Stadium, and Sweeney said he was happy with the pitch. "There was no moisture on the ball, which meant you could play a bit," he said. "That was good for players and spectators. "Everyone wants to see quicker and more open games of rugby. It's all good." "The scrum was good, there were not many re-set scrummages, which is good." The new pitch is part of a £24m redevelopment of the Allianz Stadium, and is the first of its kind to be used in professional rugby union. The WRU chief executive Roger Lewis said in December 2012 that the union would be monitoring the match at Saracens. He admitted that the union had "had issues with the playing surface" at the Millennium Stadium since it was opened in 1999. Currently the pitches are grown elsewhere and moved into the stadium on special pallets. The sort of pitch used at the Allianz Stadium has been approved for use by the governing bodies of world rugby and football. And Blues director of rugby Phil Davies said none of his players had reported problems with the artificial grass. "The boys were fine with it," he said. "There was no dew on the ball, the ball was great, nice and dry." "The scrum stayed up, which was good, there were not many re-set scrummages."